The Wallaby is the smallest cabinet in our Kangaroo Kabinet line, but don’t be fooled by its size this cabinet has BIG features! The Wallaby has a three-position airlift that holds most sewing machines comfortably and moves effortlessly up and down. Your sewing machine can fit nicely on the lift while the space to the left of the kabinet offers room for a serger, for a felting machine or even another machine. 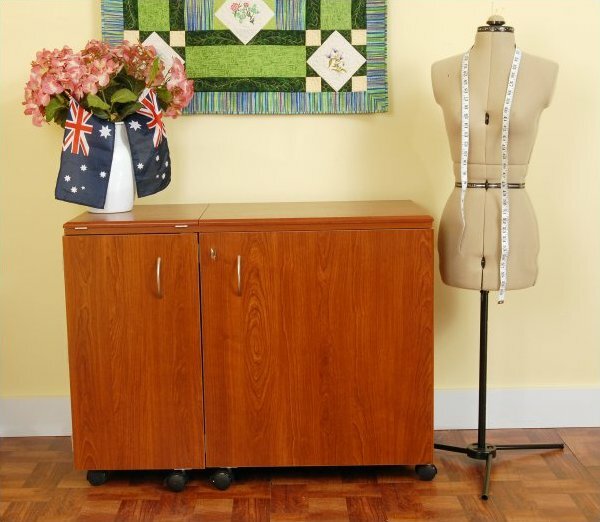 The Wallaby comes with a quilt leaf on the back of the cabinet that folds up or down and will help to expand your work area preventing large quilts or large pieces of fabric from falling on the floor behind the cabinet. Trays on the door, a large drawer and shelf keep all your sewing accessories at hand and organized neatly. Once your sewing project is complete safely conceal and secure all your sewing notions, fabric and equipment by closing both doors and turning the key to lock them shut. The Wallaby is offered in Beech and Teak melamine to complement any décor. Adopt one of our Wallabys today!